Discussion in 'Event FAQs' started by Mal3ficent, Oct 24, 2016. Please notice: You can play the event on your own (single), but it might be way easier to play in a group. *NOTE* If any changes apply to these dates we’ll let you know in advance. Entry fee: None (for all difficulties, Normal, Painful and Excruciating). In order to start the event, you’ll need to access the Oldfield map from Kingshill. Once there, head to your right and find Sophia the Elder, who will give you the “Spooky Visitors” quest line. The village of Oldfield has been having some trouble with some spooky foes and it’s up to you to help them! At a certain point, the repeatable quest “A Gruesome Remedy” will appear by Sophia. You will need to collect 50 Gruesome Minion Parts from festering fleshwalkers and pumpkin predators at Oldfield. Each time you deliver these 50 Minion Parts you will get one Sophia’s Remedy. You’ll need this to access the Darkwood map (read below). Another repeatable quest will appear after a while with NPC Sister Morana, called “An Errand for the Dead”. You’ll need to deliver 10 flexible wooden branches plus 5 tree trunks that can be farmed at Darkwood. 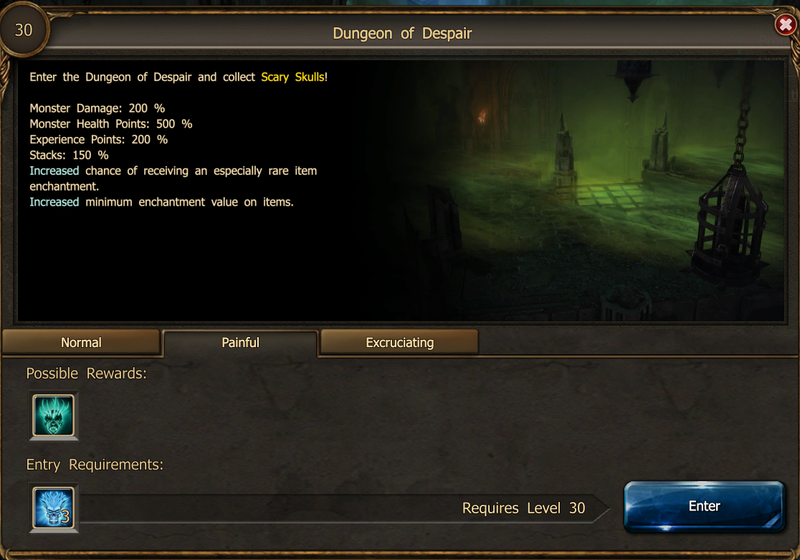 This quest is repeatable and will give you extra supplies of Draken and Light Essences. Entry fee: Sophia’s Remedy flask (for all difficulties, Normal, Painful and Excruciating). In Darkwood there are different things you can do. You can farm both Saved Souls and Light Essences by slaying the foes within the woods. You will also find NPC Larpalon, who will give you the “A Tale of Heroism” quest line. After completing these you will test your mettle against the Castle’s Keeper! Once this is done, you will get access to the Creepy Castle, where Witchqueen Gwenfara lives. Rewards: Saved Souls, Light Essences, Gwenfara’s Ghost Axe (Dragonknight), Gwenfara’s Ghost Bow (Ranger), Gwenfara’s Ghost Gun (Steam Mechanicus), Gwenfara’s Ghost Claw (Spellweaver). The Creepy Castle is the dungeon of this Ghost Festival event. Inside it, you will find NPC Ward the Ghostly Guard with the “Splinters of Desperation” quest waiting for you. In the “Will-o’-the-wisp” quest you will need to lure foggy companions to specific parts of the map – simply get close to them and see how they follow you! Deep in the castle, in the Throne Room, the ultimate boss of this event awaits. Witchqueen Gwenfara is a tough opponent that will present quite a challenge to all heroes out there. Beware of her long sword and her legion of pumpkins! Also, remember to equip Light Essences with you whenever fighting her as otherwise she will be immune to your attacks! After you kill her for the first time, do not forget to recover the old sword and tell Larpalon what happened! Entry fee: 3 Faces of Death (for all difficulties, Normal, Painful and Excruciating). Our Ghost Festival event features one challenge called Weakened Veil. When the challenge is active, simply head to Oldfield and speak with NPC Sophia the Elder to get the “The Face of Death” quest. After you help her, talk to NPC Sister Morana to activate the “Promised to Death” quest, which will grant you access to the Dungeon of Despair. Inside the Dungeon of Despair you should talk to NPC Ethan. Beware of the Toxic Smoke areas, as they will be inflicting penalizations to your health! You want to slay Tremor Terrors as quickly as possible as they drop Incense of Life, that you will need to be immune to the poison. Collect 50 of those and drop them in the brazier at the beginning of the dungeon to be immune to those! Once you complete some extra quests you’ll have the chance to meet Avalona. She may look feeble and transparent but beware of her powers. The fight is long and full of surprises, since Avalona has mastered all the different combat tactics of Dracania! Slaying Witchqueen Gwenfara could grant you the following weapons, depending on your class. Hover over the Event Window to get to know the stats for your particular weapon and its Ghost Energy effects! (Neither of these items is craftable to Tier 2 nor 3). If you complete the progress bar of the main event bar, you’ll get the following defensive items, depending on your class. Hover over the Event Window to get to know the stats for your particular weapon and its Ghost Energy effects! (Neither of these items is craftable to Tier 2 nor 3). If you complete the progress bar of this events challenge, you’ll obtain Gwenfara’s Ghostly Shroud. Hover over the Event Window to get to know the stats! Saved Soul It’s the progress item of this event. + Drop from monsters in all maps. Scary Skull It’s the progress item of the challenge. + Drop from monsters in the Dungeon of Despair. Light Essences Essential for the boss fight against Witchqueen Gwenfara. + Drop from monsters in all maps. What happens with all the event items after the event? Shall I keep them? This event will probably happen in the future again, although we are not sure when. If you wish to keep your remaining travel items or entry items, you can certainly do so. Other players may just dispose them to make more space in their inventories – that’s totally fine as well . Why do I need Draken? This is our event currency. They are useful in the game, since the event handler named Gnobhas a special store at Kingshill and sells special items which can only be bought with Draken. Go forth and conquer, heroes of Dracania!